If you share this, maybe someone will make it for you! Buffalo tuna dip, spread on celery sticks, is a perfect way to lay out an amazing appetizer that is carb friendly and guilt free. This super versatile tuna recipe is creamy and spicy while also getting that perfect celery crunch. 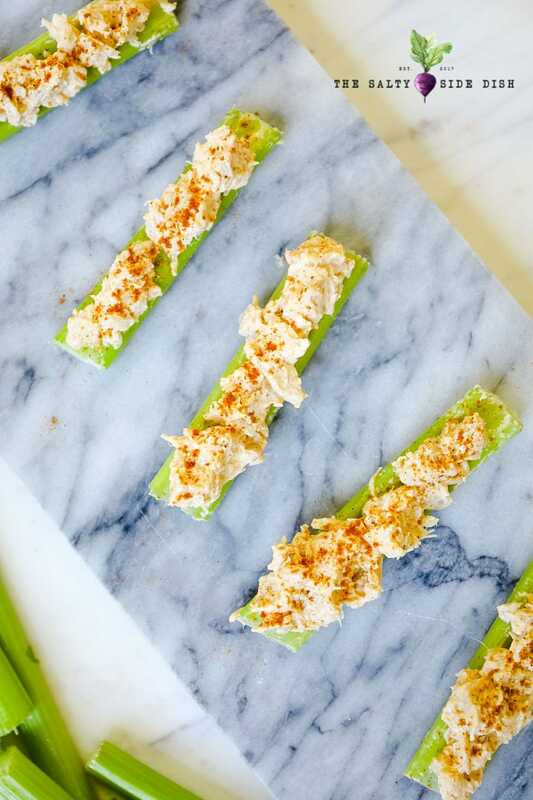 Whip up buffalo tuna celery sticks for lunch, snack, or an appetizer for a crowd. Buffalo chicken dip is always a fan favorite. Whether you make it in a crock pot all day or a 20 minute over the stove, its pretty much a staple at every party I have ever been to! But the other day I found myself out of those chicken cans and staring at the tuna. Could I take the buffalo dressing to the tuna and make it taste the same? Good news! The richness of the cream cheese, the perfect balance of the buffalo dressing, and the drained cans of tun provided a protein power backed snack that doubled over as lunch. Need more appetizers? Try Mozzarella Stuffed Meatballs or Caprese Croissants. This particular recipe is made as a topping for celery sticks. That being said, you could easily double up on this recipe to create a casserole dish full of tuna dip, serve hot and with crackers. 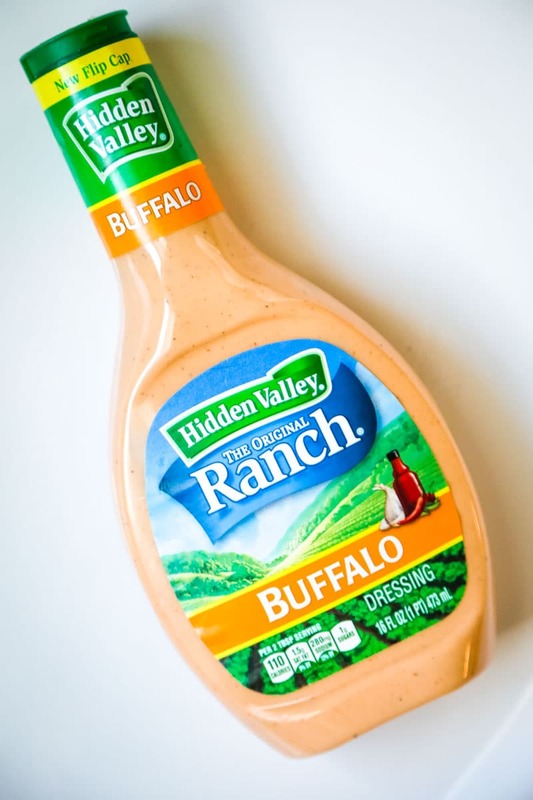 This was my first time using this Hidden Valley Buffalo dressing. Usually I take the long road and mix wing sauce and ranch, but Hidden Valley took out all the work and combined it. I was surprised; its pretty good and saved me a step. Drain your 1 can of tuna and 1 can of chicken. Heat meat, cream cheese, and buffalo dressing over a low-medium heat until fully combined. Stir often so the dressing doesn’t burn. Put in a bowl and put in fridge to cool down for approximately an hour. If you serve mixture while its hot, it will fall right off your celery. It needs to firm back up. Once cold, dish out on your celery sticks. Feel free to top with a little paprika (for color) or drizzle with some extra ranch on top to finish off. 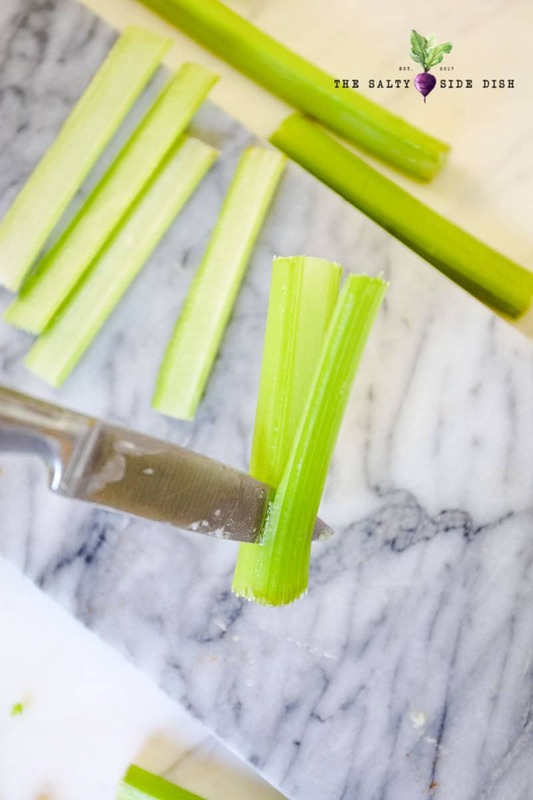 TIP: Celery falls over when left to its own devices. After all, the bottoms are curved! Its so easy to fix this, especially when serving on a tray. 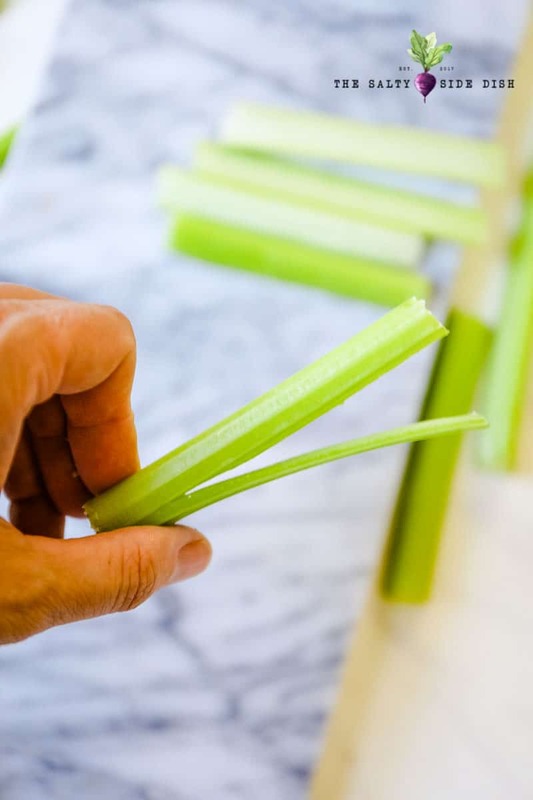 Simply trim off the back of your celery so they lay flat. You can slice down just a bare bit of it and boom, flat side. Buffalo tuna dip spread on celery sticks are a perfect way to lay out an amazing appetizer that is carb friendly and guilt free. 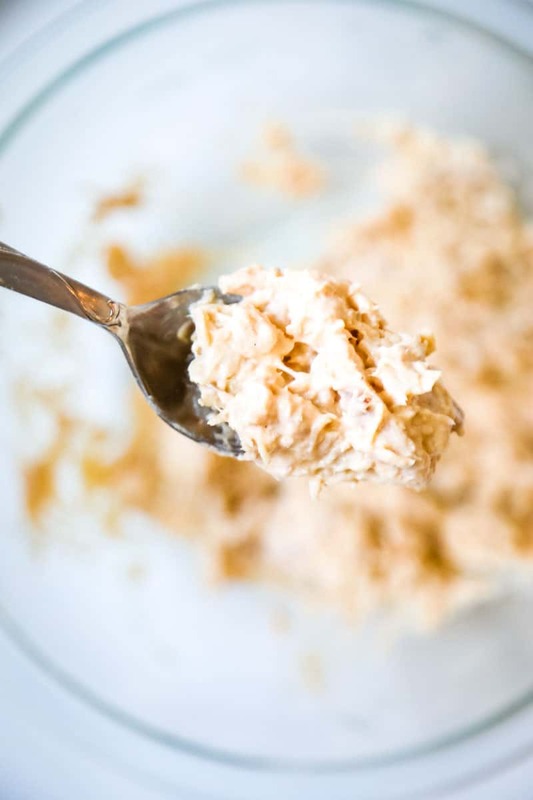 This super versatile tuna recipe is creamy and spicy while getting that perfect celery crunch. 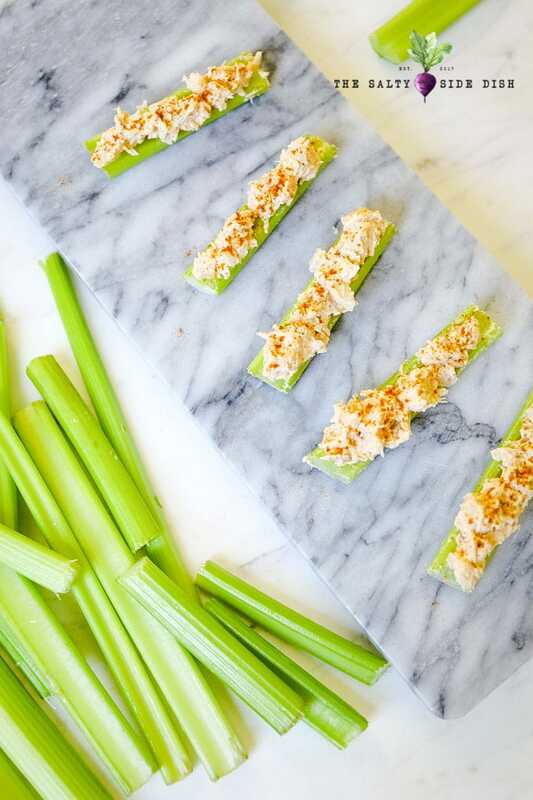 Whip up buffalo tuna celery sticks for lunch, snack, or an appetizer for a crowd. Heat meat, cream cheese, and buffalo dressing over a low-medium heat until fully combined. Stir often so the dressing doesn't burn. Put in a bowl and put in fridge to cool down for approximately an hour. If you serve this while its hot, it will fall right off your celery. It needs to firm back up. I ♡ SIDE DISHES. I feel like a meal isn't a meal without lots of delicious salads, veggies, fruits and casserole's on the side. It's what brings every one to the table! Did you make a recipe you found here? Tag @SaltySideDish on Instagram so I can see and do not forget to find me on Pinterest here. Hi, I am Trisha and I have been a blogger for 10 years. My daughter Charlotte and I are the driving force behind all the recipes here on Salty Side Dish! We really love side dishes because they are the best part of any meal! We wanted to share special side dish, appetizer, and dessert recipe favorites in hopes of making your meals a place you can really come home to. You can find us via mobile on TikTok Here.